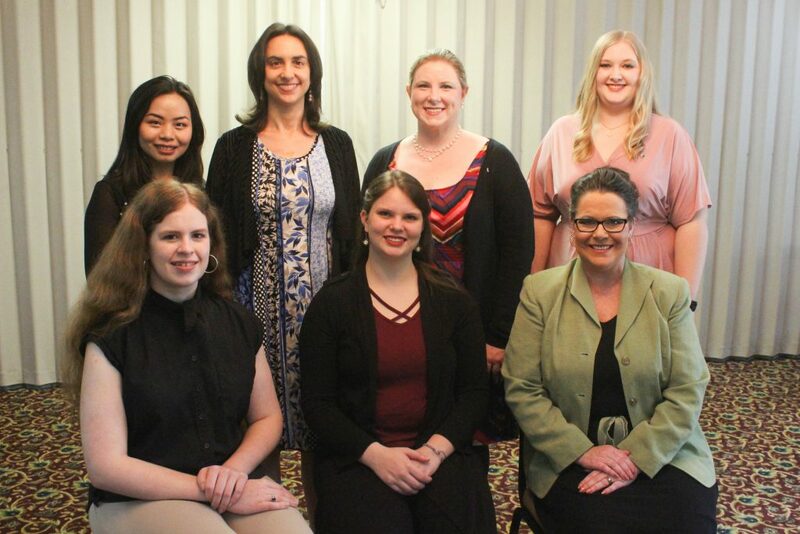 The Alpha Gamma Tau Chapter of Sigma Tau Delta at Judson College inducted three new members during its annual induction ceremony on April 2, 2019 in Archibald Hall. Founded in 1924, Sigma Tau Delta is an international honorary fraternity that recognizes excellence among students of English. Judson’s Alpha Gamma Tau chapter is celebrating its 25th anniversary this year. Initiates during Tuesday’s ceremony were Kate Wright, junior Equine Science, Journalism, and Spanish major from Kansas City, Missouri; Arienne Borowski, senior English major from Mobile, Ala.; and Tracie Harrison, English and History major from Montgomery, Ala. Current chapter members formerly initiated include Kai Bu, Micaylee Clayton, Gabby Johnson, and Sarah Lippeatt. Chapter sponsors are Dr. Stacey Parham, Associate Dean for Curriculum and Instruction, and Dr. Laura Crawford, Assistant Professor of English. The ceremony was followed by a reception for the inductees, current chapter members, and sponsors. PHOTO: Three initiates (seated, left to right) of the Alpha Gamma Tau chapter of Sigma Tau Delta were Kate Wright, Arienne Borowski, and Tracie Harrison. Standing Sigma Tau Delta members are (left to right) Kai Bu, chapter sponsors Dr. Stacey Parham and Dr. Laura Crawford, and alumna Kaitlyn Garrison.